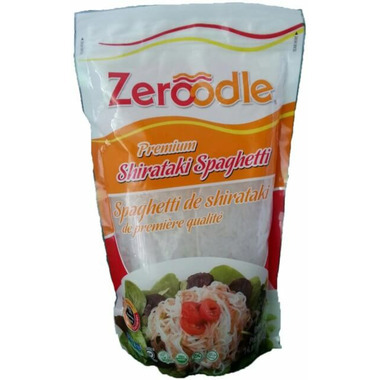 Organic Shirataki Zeroodle Pasta offers all the benefits of a health food and have no unpleasant odour, unlike other competitor brands on the market. They have a sweet flavour on their own, a tender texture and the amazing ability to absorb any delicious flavour you can dream of. This is a pasta you can be creative with! Ingredients: Water, Konjac Flour, Calcium Hydroxide. Excellent product. I use this on hcg phase 2 and it it is really outstanding! So glad I am able to have pasta without the guilt. No carb pasta is a dream. I love these noodles! When I first started following a ketogenic diet, I thought I'd have to say goodbye to pasta forever. I'm so glad I stumbled on these while browsing Well.ca. While not a 100% match to carb-filled pasta, I think it's an awesome replacement. And (bonus!) they are super easy to prepare... open the package, drain and rinse, and heat up in a frying pan. There's absolutely no smell (I hear that some brands have a fishy odor,,, not this one.) The texture reminds me of ramen noodles and I happen to love ramen! ;) Angel Hair is my favorite, but I also love the fettuccine and spaghetti. I need to try the penne next! I have been trying to find a gluten-free option for my kids that they will actually eat! This pasta option was great! Will buy again!